I have been blogging for about four years now. 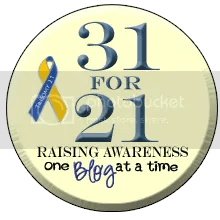 In my first year my friend Michelle at Big Blueberry Eyes began hosting the 31 for 21 challenge. Although Boo doesn’t have Down Syndrome she has a lot of friends that do. I have participated for the past three years and will do so again this year. And this year I am starting on time, so bonus points! October is Down Syndrome Awareness Month. Boo’s favorite friend at school, Jillian, has Down Syndrome. Just like Boo, Jillian learned sign-language first. Did you know that most therapies used in treatment for a person with autism or developmental delay were first created to be used for children with Down Syndrome? Sadly more fiction is out there about Down Syndrome than facts. Last summer a man (for lack of a better word) told a woman that it is immoral to have a child with Down Syndrome. He is wrong, so wrong. I am not promoting pro-life or pro-choice, it is your decision. However I urge, no beg you that if you are pregnant and told your baby might have Down Syndrome to find out the facts, find the support and find information before making a choice you cannot take back. People with Down Syndrome life expectancy has grown to be that of most peers. According to NDSS, there are more than 400,000 persons with Down Syndrome living in the US. Chances are if you do not know someone today you will tomorrow. Having Down Syndrome is a life sentence, but it can be a beautiful life. The purpose of the 31 for 21 challenge is to post every day in October. Each post does not have to be Down Syndrome related. I did focus on that today to kick off the month. Please visit Michelle’s post to learn more about participating. I hope my fellow bloggers join Michelle’s Challenge. Because awareness promotes acceptance. Just what we all want for our children. To be seen just like everyone else. To learn more about Down Syndrome, please visit the National Down Syndrome Society. This entry was posted in 31 for 21, ABA, autism, awareness, cerebral palsy, challenge, comfort, compassion, motherhood, parents, patience, yoga on October 1, 2014 by firebailey. I introduced you to my friend “J” about two years ago. She was Boo’s Yogi before life got too crazy to keep up with it. I am happy to officially introduce Jessica, the mother of four beautiful daughters. She practices and teaches Yoga for the Special Child. 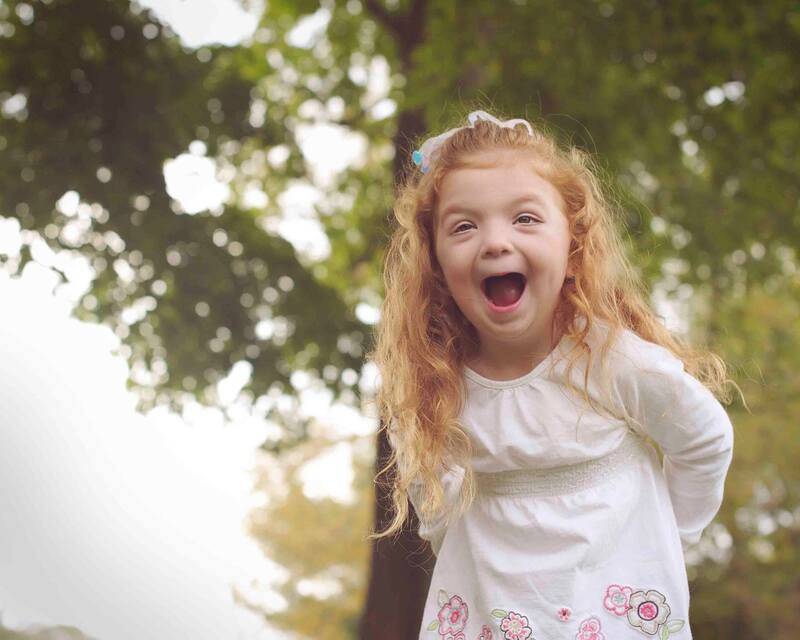 In her “spare” time she organizes The South Shore Buddy Walk and Co-Founded a non-profit Heart Beats for Down Syndrome. All of my life I have always looked to the future, planning and making lists, trying to be older. I used to sign up for things in magazines so I could get mail (at age 10). I couldn’t wait for responsibilities and bills and being an adult. I didn’t have to wait long. At seventeen, I became a mom, and not just a typical teen mom-but a teen mom to a baby girl with Down Syndrome. This is not my challenge. As I write this, it’s nine years, four more daughters and plenty of bills later, and my challenge has nothing to do with the circumstances of my life. The responsibilities I always wanted are in abundance, and can be overwhelming and stressful. There are lots of things in my life that are challenging, but not internally, causing damage to my spirit. My biggest challenge is that I struggle to be present, to truly live in the moment. I set my intention for this summer to be present, to be grateful for each moment, whether they are good or bad. Not even two weeks in, I find myself at 8am counting the hours until bedtime. I spend so much time planning and rushing for the future: bedtime, back to school, vacation, that I am unable to be happy in the present. I have a history of anxiety and depression, and looking to the future has always been a coping mechanism for me. It has served its purpose, and I have better techniques now that I can use to get through rough patches. Unfortunately, as the saying goes: Old habits are hard to break. By looking to the future, and planning, and making lists, I am depleting so much joy that is found in sitting back and watching my girls grow up and explore their world. Sure, I can get so much done when they are playing outside and doing crafts, but I lose out on seeing what interests them and how they accomplish things. I miss out on bonding and teachable moments by choosing to write lists instead of coloring and penciling in playtime rather then always making time for play. I want to wake up, and instead of rushing the day away, I want to be content just letting the day unfold and not view that as being unproductive. I may be too hard on myself, which is another challenge I face J, because it’s not like I don’t do all of these things, it’s just that I wish it could be more natural for me so that it could be more of an occurrence in my daily life. There are so many times I am in the grocery store, frustrated and losing patience, when someone stops me and tells me I’m going to miss these days. I am grateful to these people, because I know it is true, but I usually have so much going on, I forget. By not being present in the moment, but rather operating on auto pilot, I miss out on what my girls are finding to be so funny and why they think the grocery store is a giant play place. If I were present, I might enjoy the shopping trip a little more (emphasis on little) instead of being preoccupied and snapping at them, which only leads to guilt and discontent on my end. By committing to too much, and having to rush around, being present is impossible. I want to accomplish this goal by being easier on myself and reduce the expectations I set that cause me to lose out on the little things that happen when I am physically present but too preoccupied to notice and be grateful. I’m sure that many people face this challenge, and some may not even view it as being worthy of such a title. It’s the way of life today. For me, though, it is important and it is something I have been trying to work on, and fail time and again. Again, setting the expectation for myself to change right now, this summer, and all of a sudden be present in every moment, is unrealistic. I just hope that some of the time, instead of rushing to the next moment, I will have the strength to just stop and watch it all unfold and find my happiness in that. Don’t we all, working moms, stay at home moms, dads, those without children…don’t each and every one of us forget to stay in this moment. This precious moment in time? We struggle with being HERE, right here watching the sunrise because our child woke up at five freaking am. Instead our thoughts race ahead to the coming day wondering how we are going to deal with this child who will be cranky in two hours. Rather than just enjoying the moment of their smile. Even if it is five freaking am. This entry was posted in Buddy Walk, depression, Down Syndrome, patience, warrior mom, what's your challenge?, yoga on July 21, 2014 by firebailey.